Relegation battles have become the norm for Steven Notman in recent years, so you can’t begrudge the midfielder experiencing a new lease of life at Penicuik Athletic as the club compete for multiple honours. The former Berwick Rangers stalwart, who spent 11 years at Shielfield Park before his departure last April, is loving his time so far at the East of Scotland Conference A league leaders, who take on defending Lowland League champions Spartans tonight at Ainslie Park in the semi-finals of the Football Nation Qualifying Cup. 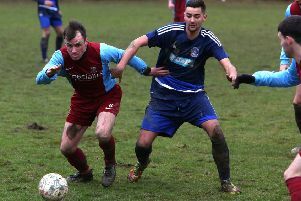 Fighting to survive relegation season after season had taken its toll, and, after moving to Penicuik in January, Notman is enjoying a world of difference. “At the end of last season, when I knew we were safe – we were away to Montrose and Cowden got beaten off Peterhead away – I was like ‘I can’t deal with this anymore, fighting relegation for the last three seasons’,” said the 32-year-old. “It was just taking too much out of me; it wasn’t enjoyable at the time, going to training and knowing you were in a dogfight. “My aim was to say to myself, ‘I need to keep the club in the league’ and then after that I was finished. That happened up at Montrose and then we had a midweek game on the Tuesday night and I went to Robbie Horn, who was the manager at the time and who I got on really well with – and I didn’t like saying it – but I was like ‘That’s me finished’. It was taking too much out of me and the family. They were a bit shocked but the time was right. “I didn’t play for nine or ten months. I had never called it a day completely, although it was kind of written a few times in Berwick reports that I had retired. Summy [Aaron Somerville, Penicuik striker] gave me a wee text after Christmas. I was starting to miss it a bit and he was kind of like ‘Fancy coming in until the end of the season and giving it a bash?’. So I signed an 18-month deal and I am enjoying it. It has taken a couple of games to get my fitness but I am starting to get there now. “I’m good pals with Aaron, he stays near me. I spoke to [joint managers] Kev [Milne] and Tony [Begg] and I liked what I heard. Hopefully I can provide a bit of experience for the younger boys. Given home advantage and their higher league status, Spartans are clearly pre-match favourites for tonight’s clash under the lights. However, Penicuik won’t go into the tie with any fear, with Norman believing the artificial surface will suit the visitors who haven’t had their problems to seek with their own pitch this season. “Spartans will go into the game as favourites being the league above but I don’t think there is any pressure on us. We will just try and show what we are made of. I would say all the pressure is on them, they are the experienced team. We go in as underdogs so there is no pressure, but we will have a quiet confidence about us and we will give it our best shot. “It suits us better on the astroturf. We will see tonight, right enough. Spartans are used to training there and playing their games there every second week so they go in as favourites, but we will go into it and be confident within ourselves and try and win the game.